I'm a strong believer in starting early with anti-aging defense. Even if it's not a product that is specifically formulated towards combating wrinkles and other signs of age, I do believe that keeping your skin hydrated and moisturized is a solid defense. Your eye area is one of the first places to show signs of aging, especially now with the constant squinting at phone screens and the ease of makeup wipes to take off your makeup, the skin there really could use some extra loving! I've put together a quick list of my top 5 favorite eye treatments in a whole range of prices and practicality of when to use them too! I thought the first one I should tackle is something that directly combats anti-aging. If you have even the hint of crow's feet forming, pick this up stat. Extremely affordable and found in the drugstore this is a miracle worker for really hydrating your skin and helping to smooth out the appearance of crow's feet and other wrinkles! The price tag makes me cringe but this is hands down my favorite eye cream of all time. A little bit goes a long way and it's a fairly generous jar of goo. This cream is very light on your skin but ultra moisturizing so it was great anytime. It also helped to soften the appearance of the skin as well as brighten it up. This is coming from a girl who hates Murad products so you know how life changing this stuff was for me! When I want some quick to wake up my eyes in the morning, this eye roll-on is my favorite. It actually took me quite awhile to find this since I got one in Birchbox but then they stopped selling it in the store. This instantly de-puffs your eyes and helps brighten them so when I'm fighting lack of sleep and running late all at the same time, this is definitely a holy grail. I have pretty oily skin so whenever I can find a gel alternative to anything I put on my face it usually is a winner. This stuff is great because it comes in a very sanitary bottle with a pump, and the fast absorbing gel is very light on my skin. It also is excellent at smoothing out the area and keep it moisturized throughout the day. This one is an oldie but a goodie and was probably the first eye cream for many people. This cream is really cool because once you start patting it in, it almost turns into a watery consistency as it warms up against your fingers. It's very hydrating and softens the area well, however I find that it leaves the skin looking a little shiny so this is something I prefer to put on at night only. 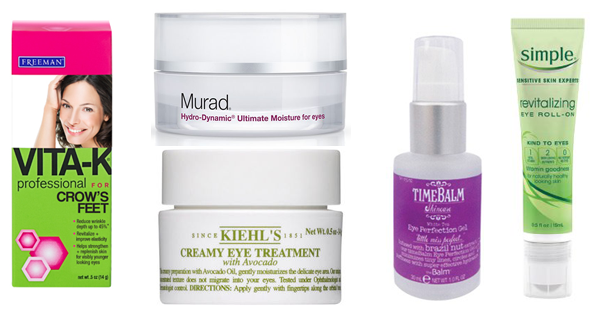 What are some of your favorite treatments for the eye area?